If you want a healthy rose bush with lots of blooms, your roses will need some attention through the summer. 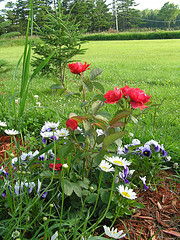 The compost you added to the planting hole will feed your rose through it’s first bloom. Each following spring, fertilize after you remove winter protection. Use a low nitrogen fertilizer, there are several types specifically for roses. Too much nitrogen will promote leaf growth rather than flowering. Better yet, for the first spring fertilizing, use a mixture of 1 cup bone meal, 1 cup cottonseed meal, 1/2 cup blood meal. Prune out any spindly growth from the base, wayward or crossed branches, and dead or damaged branches. Check the Pruning Roses page for spring pruning after the first planting year. Spray the stems, leaves and ground surrounding your rose bushes with fungicide each spring when the leaves begin to appear to help prevent rose disease. Note: Rugosa Roses do NOT like chemicals and do not need to be sprayed because of their excellent disease resistance. After the first blooms have faded, fertilize again. Make sure your roses get an inch or two of water each week. If your soil is clay, perhaps every 10-14 days. Roses like consistent moisture, but not wet roots. To keep the leaves dry as much as possible to help prevent fungus, water with a slow trickle from the hose into the soil, or with a soaker hose. If you must use a sprinkler, use it in the morning. Inspect the plant periodically for aphids, and spray them off with a good blast from the hose. Leaves that show signs of rose diseases such as black spot or powdery mildew should be removed and thrown in the trash, NOT in the compost heap. Fallen leaves and petals should also been cleaned up periodically and thrown in the trash. If any pest or rose disease causes enough damage to disfigure the plant, cut it all back to about 12 inches again (check the specific disease instructions that follow). The rose bush will produce new leaves, and probably new blooms the same season. Be sure to check the page about controlling rose diseases and insects. Fertilize about once a month through the growing season. Your roses may bloom through October, or November further south. Do not fertilizer in the fall, it will encourage new growth that will be damaged in winter. In zone 5 and north, do not fertilize past the middle of August. Zone 5 may take a final fertilization by end of August, perhaps a bit later in zones 6 and 7. You may want to leave some blooms on the bush to form rose hips. The red or purplish fruit adds winter interest and attracts birds. Roses like a pH between 6.0 and 6.9. Fall is a good time to add lime to the soil if you need it. Check the pH first, then mix additives into your soil as needed. See Soil Amendments for more detail.